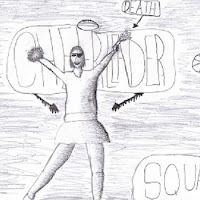 (Leo): I came up with the name Cheerleader Death Squad the day after I watched Kill Bill Vol.2 for the first time. 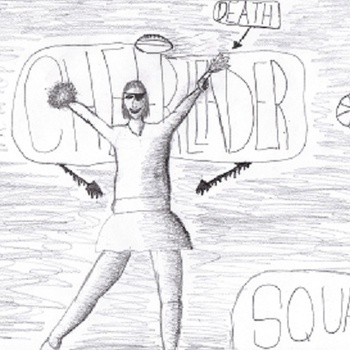 Every other person in that movie is a female assassin with like a gun or samurai sword, so that just evolved into cheerleader assassins, and thus, Cheerleader Death Squad. We'll probably release a full album or something when our recording setup is a little less..... problematic. At first we were Pandaray where Leo was on drums and Aidan and I would switch off between bass and guitar. At one point Aidan got the idea for a noise rock band, so we sorta switched back and forth between the two. We played a show with DAADs, and KSP on fathers day at Waffle Frolic and afterwords we realized we needed a singer to front the band. Leo was the first one to step up to the plate. Since I knew how to play drums, I just took his place, he became the singer, and that brings us to where we are today. Catch Cheerleader Death Squad live in their IU debut with Zorch (Austin, TX), Daffodil (Binghamton), and Laika + Luddite Machine on Monday, August 29th at The Space @ GreenStar, 700 W Buffalo, Ithaca, NY 14850 - 8PM, $5, ALL AGES. 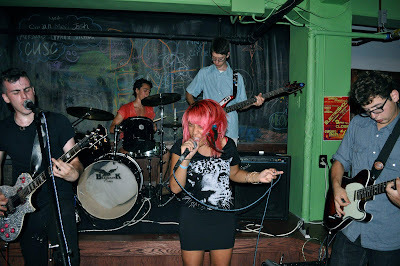 Footage from Saturday's show with the mighty ZRUDA! Featuring the drummer & guitarist formerly of Gaylord. We aim to have them back soon. Killer sci-fi, technical psych-synth-metal that is just THE most fun live. Check out some photos of the whole show here. Here's footage from Beach Parade's last show ever / Bubba's birthday show. Hope you were here for this one! Check 'em out here or head to the IU YouTube page for HD. 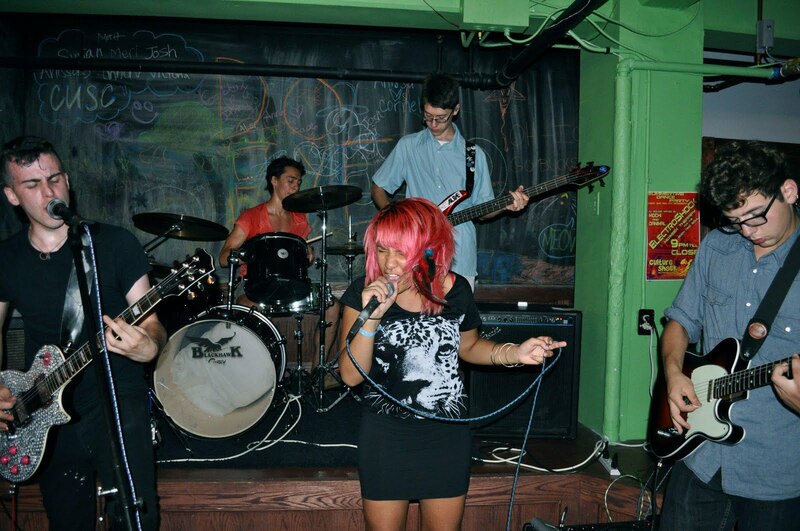 Big Fun (upcoming August 2011)- this is the debut Doll Eyes album, recorded live, and produced by Chris Ploss. You can buy it for 5 dollars physical, or 3 dollars digital from bandcamp soon. Bio: Four of us used to be in various lineups of this punk band called The Motivators when we were in highschool. Jacob and Eli started writing the songs for our new album last summer, and this summer we finished writing it, added our new singer, and got it all recorded. We like to have Big Fun with our music, and we hope you will too. Influences: Queens of the Stone Age, Radiohead, Arctic Monkeys, At The Drive In, Yeah Yeah Yeahs, The Stooges, T. Rex, Pixies, Surfer Blood, Santigold, Waka Flocka Flame. Sounds Like: A groovy, catchy punk band that uses way too many jazz chords. Catch Doll Eyes live, opening this Saturday, August 13th at The Haunt, 702 Willow Ave, Ithaca, NY 14850 with Braveyoung, Beach Parade, Crime Pays, and Mouth To Mouth To Mouth. Doors at 5PM, they're on 6PM. FREE SHOW! Braveyoung (formerly known as Giant) hail from Greensboro, NC and compose beautifully lush and complex instrumental music for your aural pleasure. Their latest, We Are Lonely Animals and their preceding EP Song found release through the mighty The End Records (Sleepytime Gorilla Museum, Ulver, Goes Cube, etc). 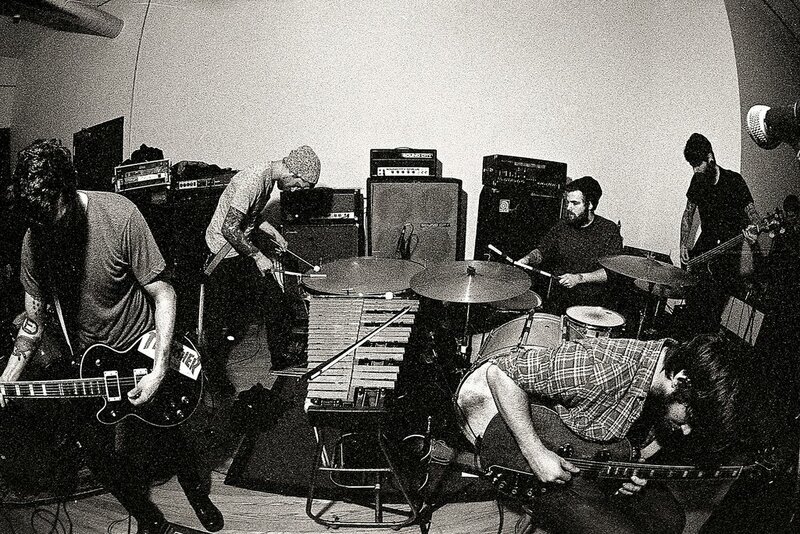 They've had a busy 2011 so far with the release of their latest LP and a pending collaboration with The Body. Up next the troop is about to launch on a Northeast US/Canadian tour with our friends in Rosetta. On their way back home, Ithaca Underground is presenting an absolutely FREE show with this fantastic five-piece in celebration of Bubba (IU main-man) Crumrine's birthday and the final performance of local favorites, Beach Parade. BY bassist and co-founding member Zack Jones takes a few minutes before they hit the road for some quick Q&A. IU: For the uninitiated, could you give our readers a bit of background on how you, your brother, and Kyle (and Derrek at the time) all met and started writing music together as what would become Braveyoung? Zack: Isaac and I have been playing together since we were children. We grew up in a small farmtown in rural NC, fortunately immersed in a very musical family. Kyle and Derrick were living in greensboro when Isaac and approached them about working with us on some stuff. We had already written what would become the red opus, and some other stuff we later discarded. IU: When did Ben come into the picture? Zack: Rodney, who had been working with us during the recording of 'song' and some tours following that, decided to have a family. Ben is a long time friend, and he was over what he was involved in musically at the time, so after continuing for quite some time as a four piece, we asked him to help us flesh out some bigger ideas. IU: Earlier this spring the band released "We Are Lonely Animals" What are some of your favorite moments of the LP - ether of the process or the composition itself? Zack: There have always been long drags of time between records with braveyoung, mainly because it is expensive to produce a record the way we feel like a record should be produced. We had been stuck on a collection of recordings that over 2 years of production, had thousands and thousands of dollars invested in it, only to be discarded. It was an intensely confusing time for us, and when Derrick decided to leave the band after 5 weeks in Europe, it gave us the opportunity to just completely move on from that material. The writing was, personally, one of the most intimate and favorable experiences of my life. We also got to record live, which is something we always felt would benefit us. We were very excited to finally be able to put to record what we had been doing live for the past few years. Trying to compose some pieces that had a severe amount of weight to them without being "heavy", in a common sense of the word. I really like how quiet the record is. IU: Also earlier in the year, you all collaborated with The Body on a studio project - any updates on when the world might get to hear what came of the sessions? Another great IU show at The Space! Thanks to everyone who came out to this one. Solid footage from NYC's Meek is Murder and Tiger Flowers, more clips of Crime Pays including a new song, and one of CNY's newest metal acts, the uniquely ambient instrumental metal Paralysis at Dawn. Get on... Q&A with three of the four posted elsewhere on FREE!.